My affiliation with Home ReSource began five years ago when I joined the Board of Directors. I didn’t know a whole lot about the organization when I started. I was familiar with the store for mostly selfish reasons – picking up an inexpensive door or window for some home or cabin project. Over time, my understanding of, and enthusiasm for, the mission, programs and events has grown. Aside from diverting valuable home building materials from the landfill, Home ReSource supports a Zero Waste Ambassadors Program (ZWAP!) for Missoula-area fifth-graders, a job skills training program serving at-risk youth and adults, and a Materials Giving Program for local schools, non-profits, and community events. Together, these programs support a greener, more sustainable, and community-minded Missoula. Super great! 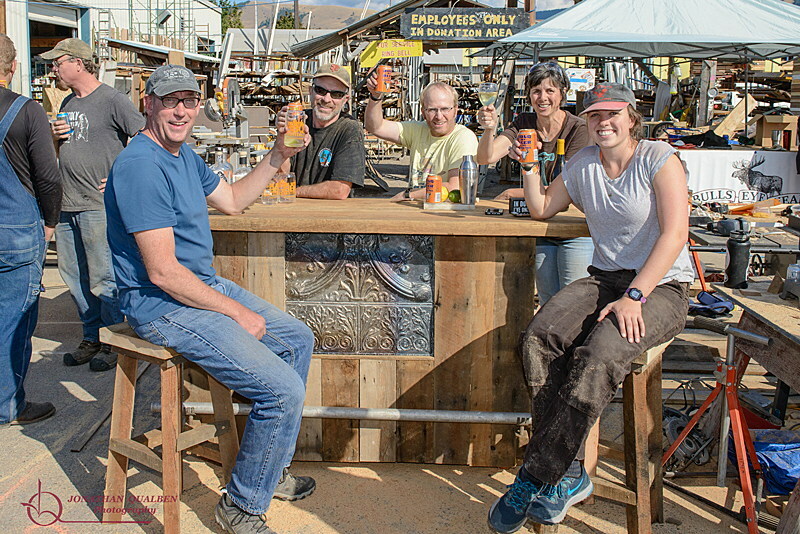 Home ReSource’s Community Sustainability Programs are supported by two complementary annual events – Spontaneous Construction (SponCon) and the Home ReSource Banquet & Benefit Auction. SponCon is a community celebration, where the whole family can participate in creative reuse. At the center of SponCon is a building contest. Teams ranging from the very skilled to not-so-skilled spend seven hours constructing various creations from reused Home ReSource materials. Families can watch the building in action and take-in live music, food carts, and tons of kid’s activities including giant jenga, paint-a-door, Spin Art, building projects, and creative sound exploration. The Benefit Auction doesn’t need a whole lot of description, except to highlight that live-auctioned items come from the SponCon competition and bring the vision of creative reuse to life. I attended my first SponCon as a spectator and volunteer. Fun day, big mistake. As someone who watches Project Runway for guilty pleasure, the opportunity to participate on a SponCon building team was not to be missed. For the last three years, I have organized Team All Elbows, consisting of my family and a couple of close family friends. I wouldn’t describe All Elbows as overly artistic or skilled. We are more aligned with celebrating reuse. The extent of our creativity is building furniture using weathered wood. Our last entry was titled “rowdy bar crowd not included,” so you get the idea. While my husband knows his way around a level and saw, the rest of us take directions, scrounge the store for materials, and do low-skilled tasks like sanding and painting boards. We look to other teams to wow the audience and judges – and wow them, they do. From welded lamps made entirely of socket wrenches to a 13-foot kinetic art sculpture, some teams have SponCon in the bag. The rest of us just love being part of the show and spending the day with our community members. What began as a one-time event for All Elbows, has turned into a standing date. This year, my son will drive from Bozeman to spend his day off creating our super-secret (yet to be identified) entry, as will my daughter living in town. With grown kids, family occasions are harder to come by and I’m so glad SponCon remains one of them. After all, SponCon represents a culmination of what I hope I’ve imparted to my family: Reuse and sustainability matters. Building community is a value beyond money. And, competition is fun, even if you aren’t that good. Spontaneous Construction 2018 happens at Home ReSource on Saturday, September 15. Visit homeresource.orgfor more details. Catherine Ipsen serves as the Associate Director at the Rural Institute for Inclusive Communities and Director of Rural Employment Research at the RTC: Rural at the University of Montana. Catherine is a former Home ReSource board member and current Home ReSource events committee member. September 8: Watershed Education Network‘s stream monitoring training (Free). For more info call 541-9287 or water@montanawatershed.org. 802 E. Front St, Missoula from 12:00-4:00 p.m.
September 8 & 11: Volunteers needed for Missoula Bike/Pedestrian count. Help the city determine needs and how to improve bike/ped systems. Counts will be Sept 8 noon to 2pm and Sept 11 from 4-6pm (except UM stations will be 3-5pm). September 15: 14thannual Spontaneous Construction festival of creative reinventionat Home ReSource. Building contest starts at 9 a.m. Kid’s activities and local food start at 11 a.m. Live music all day. Sign up to volunteer. Free admission; building contestants pay a registration fee.